Industry figures indicate that over 80 per cent of all trucks on the road have tandem axles that are misaligned. 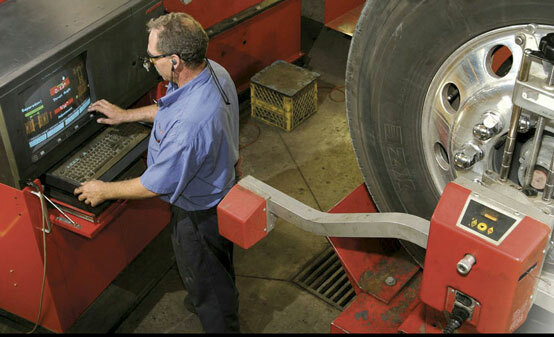 Same figures indicate that 90 per cent of all trailers have a serious misalignment. If the drive axle’s are misaligned, to keep the truck going straight, the turning force of the tandem must be offset by turning the front wheels in the opposite direction. This causes all 10 wheels to scrub mile after mile. It takes just 1/10″ to have a big impact on your costs. For example, a tractor with a drive axle offset of just .100″ (or .19 degrees offset-3/32nd size shim) after 100,000 miles would be equivalent to dragging the tires sideways for 100 miles. This can reduce tire wear up to 30 per cent. Reduce fuel usage (a 1° misalignment on one axle could increase fuel consumption by around 5 per cent).